To make the tag below, you also will need to get the kit called LETTERS FROM HOME, which can be purchased HERE or HERE. 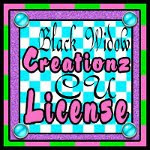 I used the gorgeous tube called SEDUCTRESS by Tatjana Willms which requires a license to use. You can find it at Dreamscape Imaging, just click HERE. I also used FTU circle masks from the Creative Misfits. You can get them HERE! 1. Open up as a new layer the Paper 1 from kit. Go to LAYER>TRANSPARENCY>ADD ALPHA CHANNEL. Resize to 700 x 700. Duplicate this layer. 2. Open as layers the circle 5 mask by Caroline and resize to 750 x 750. Also open the mask by Aqua 140 and resize that to 850 x 850. For each mask, you need to click on their layer in layers box and go to COLORS>INVERT and LAYER>TRANSPARENCY>COLOR TO ALPHA. Then you will want to right click on one and choose ALpha to Selection. Then go to SELECT>INVERT and click on the paper 1 layer in the layers box to make it active and go back up to EDIT>CLEAR. Now that mask is made with the paper. So delete the original black mask. And repeat this step with the next mask. 3. Open paper 5 from kit. Resize to 500 x 500. 4. Open scattered hearts 2 and scattered hearts 4. Resize scattered hearts 4 to 598 x 484. Position them directly beside the hearts 2. Merge these two layers and place them appropriately. 5. Open as layers the cluster frame. 6. Use the Ellipse Select Tool to get a circle within the frame. Go to SELECT>INVERT and then click on paper 5 layer in layers box. Go to EDIT>CLEAR then SELECT>NONE. The paper should now only be in your frame. 7. Open your tube of choice. Place it appropriately. Add a drop shadow to it. Go to FILTERS>LIGHT AND SHADOW>DROP SHADOW and settings at 4,4,9. Change the opacity slider in layers box to 41%. 8. Make sure to put the correct copyright info on your tag. The artist's name, website, and license number if applicable must always be on your tag. Many tubes come with the artist name and website credit info already to make it easy for you! 9. Use the color select dropper tool to get the color from the flowers in the frame. Then type your text in with this color. I used a font called French Script MT. Next, just right click on the text in the layers box and go to SELECT>GROW by 2 and then add a new layer. Use the color drop tool to get the color from the gold part of the tube and then use the bucket fill tool to fill the new layer in with this shade... This is a good place to save your work just in case you need to come back to fix anything. Save as an .xcf Then come back and merge your text layers together. Go to FILTER>DECOR>ADD BEVEL with the thickness at 5. Then add a drop shadow to this. I had the settings at 2,2,6. Thank you so much for this post. I want to let you know that I posted a link to your blog in CBH Digital Scrapbooking Freebies, under the Page 9 post on May. 08, 2011. Thanks again.